Volunteering with the FOO Sea Turtle Research Program was a wonderful experience. My observations and field notes taken while on the Osa Peninsula were used to complete the final independent study project of my Master of Environmental Studies at Virginia Commonwealth University (VCU). 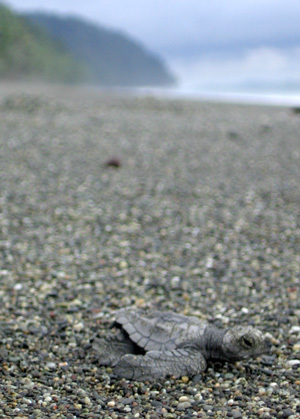 The topic of my independent study project was Global Threats of Sea Turtles. I graduated from VCU in December of 2010 and feel very lucky to have had this volunteer/research opportunity on the beautiful Osa Peninsula. The personnel at the FOO Sea Turtle Research Center were very helpful in my data collection and field studies, even after I returned home to finish my independent study. I couldn’t have asked for a more hospitable and professional research program. Getting from San Jose to the research center was quite an adventure. Visiting the Osa during the height of the rainy season made it a bit tricky, but it was well worth the effort. I spent nine thrilling days and nights at the Osa Biodiversity Center from the end of October through early November of 2010. 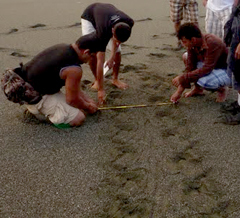 I participated in four night beach patrols and two day beach patrols with the sea turtle research program. Watching the sea turtles nest at night was a magical experience that I’ll remember for the rest of my life. With several FOO conservation projects underway, I had the opportunity to learn a lot about the local biodiversity of the peninsula. I stayed busy, practiced Spanish a bit, received plenty of rest, and filled my belly with wonderful home-cooked meals served onsite at the research center. The people of FOO were a lot of fun and I enjoyed working with them. I’d do it all over again! Thanks for everything FOO. I’ll be forever grateful.